It's 3am, Wednesday, and I am finishing the booking of air and travel for the next 10-day assignment which begins after I finish photographing Kermit the Frog on Capitol Hill, travels to Rochester NY, then Los Angeles, then Las Vegas, then Oakland, then Los Angeles, before returning to DC. It's an exhaustive trip, and we spent much of the day today in pre-production, packing bags to confirm to size and weight restrictions, and so forth. In Los Angeles, the client is staying in the West Hollywod area, and gave us several recommendations for where to stay. Typically, we make these calls ourselves, however, we were surely amenable to their suggestions. One of them was the Hyatt West Hollywood. I checked Orbitz (graphic above), and it was $215 a night, for this 4-star "upscale" hotel. I decided to have a look at Priceline, to see where hotels would fall price-wise. 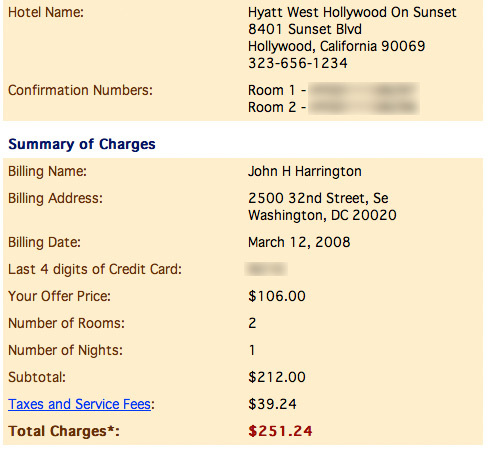 Remarkably, by selecting 4-star, and West Hollywood as my options, I found myself and my team booked into...the Hyatt West Hollywood for $106 a night! A significant savings, to be sure! Laughably, Orbitz's site says "lowest price guarantee", which is clearly not the case here. In the end, this was over a 50% savings from booking with Orbitz. I post this as a suggestion that, as the title of the entry says, "it pays to do your homework." On March 4th, your vote will decide who will be in the White House to pick up the phone when it rings at 3 AM. Yet, one of the children in the video is now all grown up, is 18, and is an Obama supporter. her family shopped her out as a little girl to be in non-POLITICS OF FEAR commercials, and that footage was then sold to the wire service Getty. That way, cheap Getty subscribers, like the Hillary Clinton campaign, could use the footage for anything -- including the POLITICS OF FEAR. Clicking the image above gets you to the MSNBC footage from NBC's Today Show where they interview the now-voting-age young woman. Visiting the YouTube link above has other interviews of her by several other outlets. I share this story with you not as a story critical of Getty (NYSE: GYI) per se, but as one that demonstrates the risk of using stock footage, where assignment work gives you guarantees and protections. We reported last November ( Black Friday? Try, "You Get What You Pay For" Friday! , 11/27/07) about the risks of RF, and, non-exclusive RM. In fact, with RF, for example, you have little to no control over the exclusivity of an image/video clip. With RM, you can at-least secure an exclusivity license for a term. The ASMP website has several examples of how this problem became a poke in the eye for dualing companies, (Rights Managed Stock vs Royalty Free Stock - Is RF the bargain they claim? ), but it stands, thus, to reason that the better solution is the commissioning of original content that has A) never been seen, B) has an exclusivity term, and C) has been properly contracted so that the subjects in the images/video don't go destroying your message. Since Getty should have had the releases on file, due-diligence on the part of the Clinton Campaign should have taken place where they not only paid additional fees for exclusivity of the footage for a period of time, but also contacted each of the people in their stock footage to ensure they were either a Clinton supporter, or would atleast remain mum about their position for the election. Better yet, try not going the cheap route, and shoot the footage yourself!